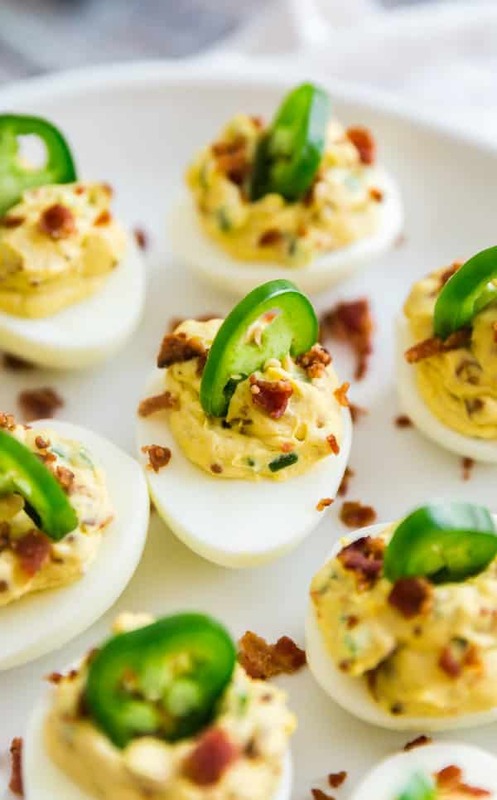 Deviled Eggs with Bacon and Jalapeños are basically Jalapeno Popper Deviled Eggs. They’re cheesy, creamy and have a deliciously spicy kick! No matter how much I’ve eaten, I always have room for deviled eggs. I love eggs in general but deviled eggs have an extra special place in my heart. 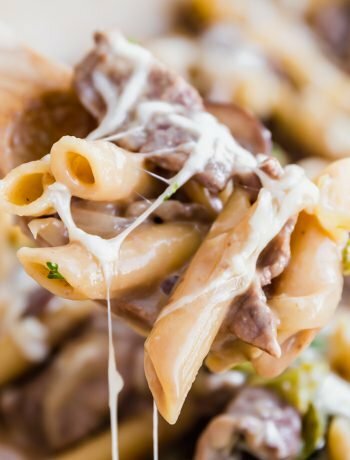 They’re so perfectly creamy and full of flavor. 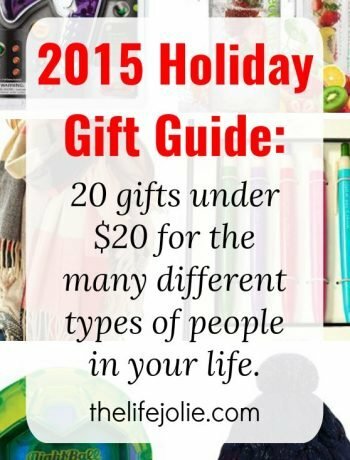 And the best part is, there are about a million different ways you can get creative with them and make them unique. 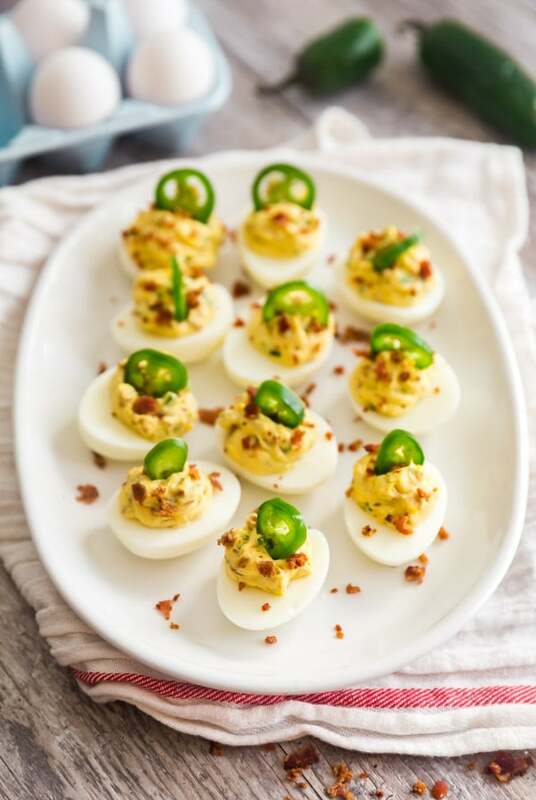 Today’s variation on Traditional Deviled Eggs is inspired by a spicy party favorite: Jalapeno Poppers. They have the creaminess of the cream cheese, the smokiness of the bacon and a fantastically spicy kick from the jalapeno pepper. You’re basically taking simple deviled eggs to the next level. 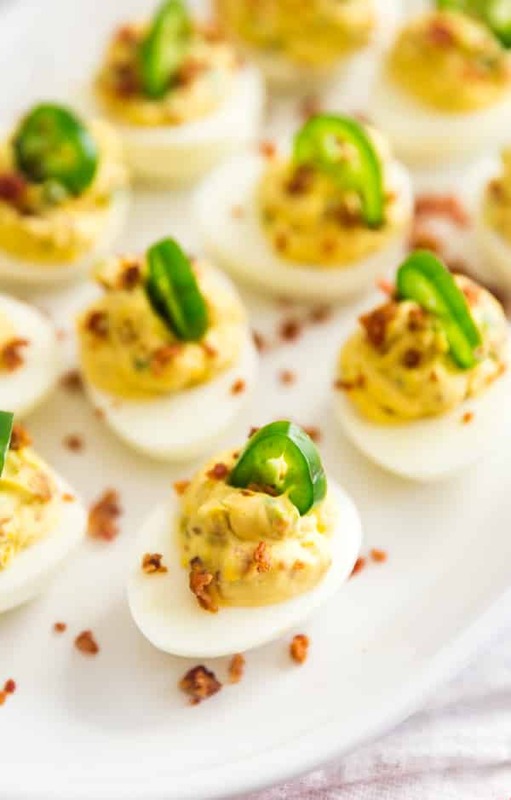 How long can deviled eggs stay out of the refrigerator? I’d say 2 hours at most. To be safe, keep the plate on ice. Are deviled eggs bad for you? 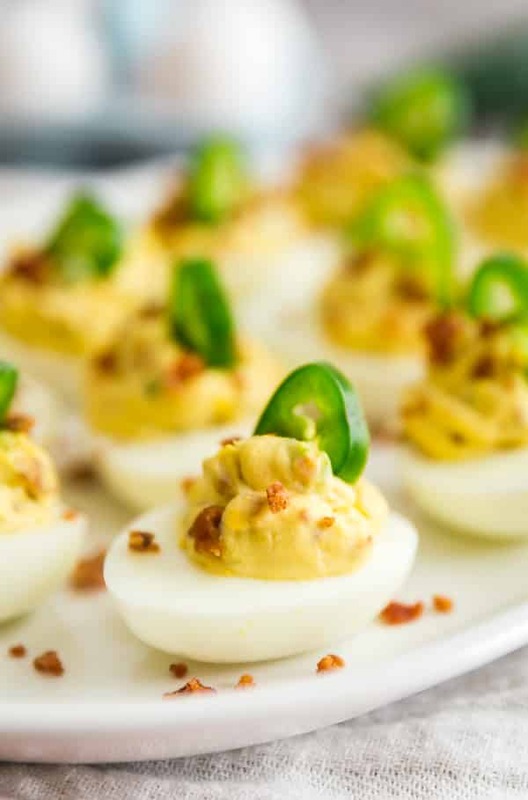 While there are many, many worse appetizers, deviled eggs aren’t exactly good for you. They’re pretty high in fat and cholesterol but everything in moderation. Can deviled eggs be made ahead? Yes, they can be made up to two days ahead. How do you cook hard boiled eggs? Place the eggs in a pot of cool waters so that they’re completely covered. Bring the water to a boil and once it’s boiling cover, reduce the heat to low and simmer for 13 minutes before plunging into an ice bath. You can cook them for a shorter amount of time for a less-solid center but for this recipe I like the yolks to be fully cooked through. What’s the best way to peel a hard boiled egg? I suggest doing so carefully under cold water. I’ve also heard that using eggs that are slightly older (not rotten, just not brand-spankin’ new) will heed and easier-to-peel egg. What’s the best way to get the egg yolk mixture back into the egg whites? I like to snip the corner off of a sandwich size plastic zipper bag and use that to “pipe” the mixture in. Works like a charm! 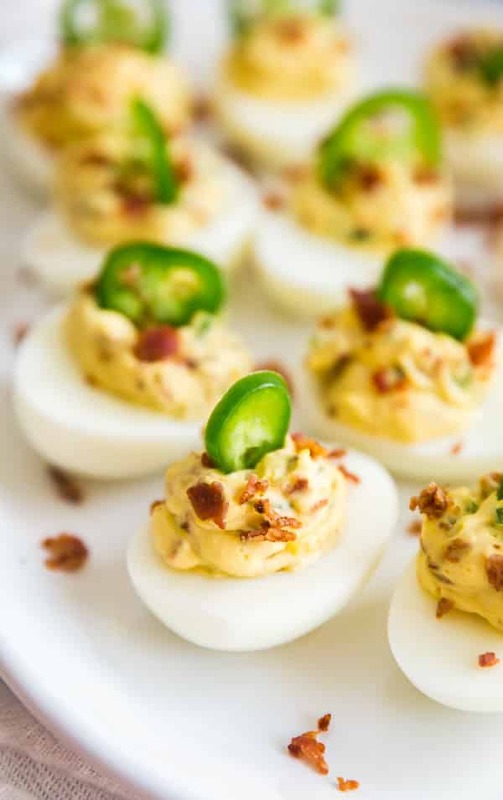 Deviled Eggs with Bacon and Jalapeños are basically Jalapeno Popper Deviled Eggs. They're cheesy, creamy and have a deliciously spicy kick! Carefully slice the eggs in half the long way and place the yolks into medium mixing bowl. Rinse and pat dry the egg whites and set aside. 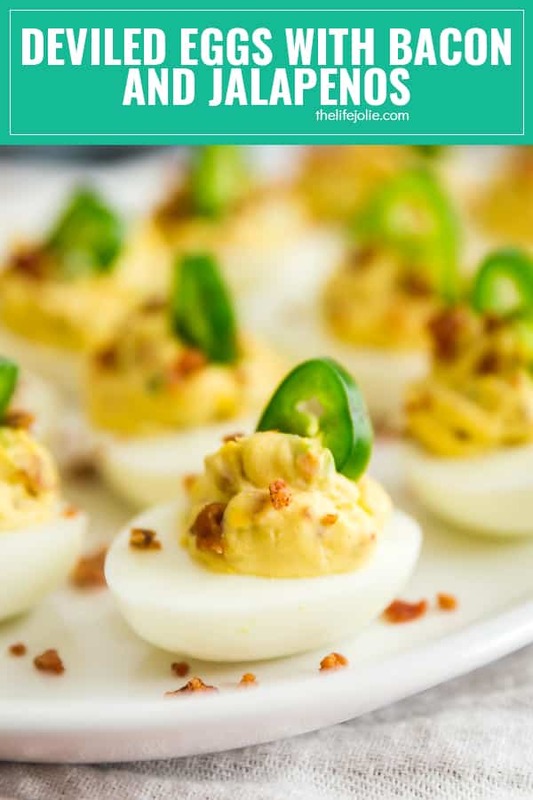 Into the bowl off egg yolks add cream cheese, mayonnaise, vinegar, all of the minced jalapeno, and all of the bacon except for 1 Tablespoon. Mix well until fully combined. Place the mixture into a sandwich size plastic zipper bag and snip off the end. Use that to "pipe" the mixture into the egg whites. Sprinkle on remaining bacon and place a slice of the other jalapeno pepper into the top of each yolk. Refridgerate until you're ready to serve. These will last 3-4 days in the refrigerator in an air-tight container. They can be made a day or two ahead.